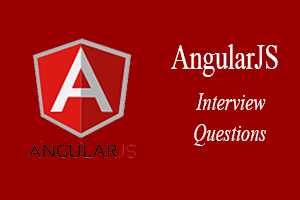 A list of top frequently asked AngularJS interview questions and answers are given below. 2) What are the advantages of AngularJS? 3) What are the disadvantages of AngularJS? 4) Is AngularJS dependent on JQuery? 5) What IDE's are currently used for the development of AngularJS? Eclipse - It is one of the most popular IDE. It supports AngularJS plugins. Visual Studio - It is an IDE from Microsoft that provides a platform to develop web apps easily and instantly. Aptana - It is a customized version of Eclipse. It is free to use. 6) What are the features of AngularJS? MVC - In AngularJS, you just have to split your application code into MVC components, i.e., Model, View and the Controller. Validations - It performs client-side form validation. Modules - It defines an application. Directives - It specifies behavior on the DOM element. Templates - It renders the dynamic view. Scope - It joins the controller with the views. Data Binding - It creates a two-way data-binding between the select element and the orderProp model. Filters - It provides the filter to format data. Services - It stores and shares data across the application. Routing - It is used to build a single page application. Dependency Injection - It specifies a design pattern in which components are given their dependencies instead of hardcoding them within the component. Testing - It is easy to test any of the AngularJS components through unit testing and end-to-end testing. 7) What are the directives in AngularJS? Directives are the markers on DOM element that is used to specify behavior on that DOM element. All AngularJS directives start with the word "ng". There are many in-built directives in AngularJS such as "ng-app", "ng-model", "ng-controller", "ng-repeat" etc. Let's see a simple example of AngularJS directive. 8) What are the controllers in AngularJS? 9) What is the usage of controllers in AngularJS? 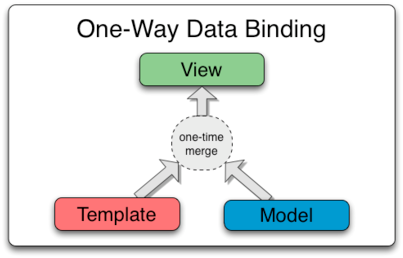 10) What is data binding in AngularJS? One way data binding (used in the classical template) - Here, a value is taken from the data model and inserted into an HTML element. 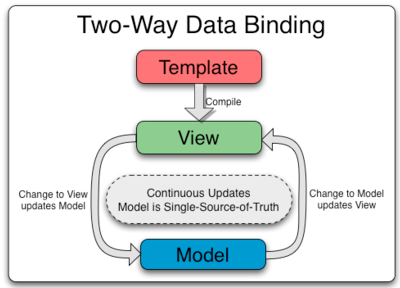 Two-way data binding (used in the AngularJS template) - It treats the model as the single-source-of-truth in your application. The view is a projection of the model at all times. If the model is changed, the view reflects the change and vice versa. 11) What are the services in AngularJS? Services are objects that can be used to store and share data across the application. AngularJS offers many built-in services such as $http, i.e., used to make XMLHttpRequest. 12) What is the module in AngularJS? 13) What is the scope in AngularJS? A Scope is an object that represents the application model. 14) What is routing in AngularJS? A routing is a mechanism that builds an application as a Single Page Application. It routes the application to different pages without reloading the application. 15) What is a template in AngularJS? A template consists of HTML, CSS and AngularJS directives that are used to render the dynamic view. 16) What are the expressions in AngularJS? AngularJS supports one-time binding expressions. 17) What is the use of a filter in AngularJS? 18) What are the different types of filters in AngularJS? Currency - It formats a number to a currency format. Date - It formats a date to a specified format. Filter - It selects a subset of items from an array. JSON - It formats an object to a Json string. Limit - It is used to limit an array/string, into a specified number of elements/characters. Lowercase - It formats a string to lower case. Number - It formats a number to a string. Orderby - It orders an array by an expression. Uppercase - It formats a string to upper case.